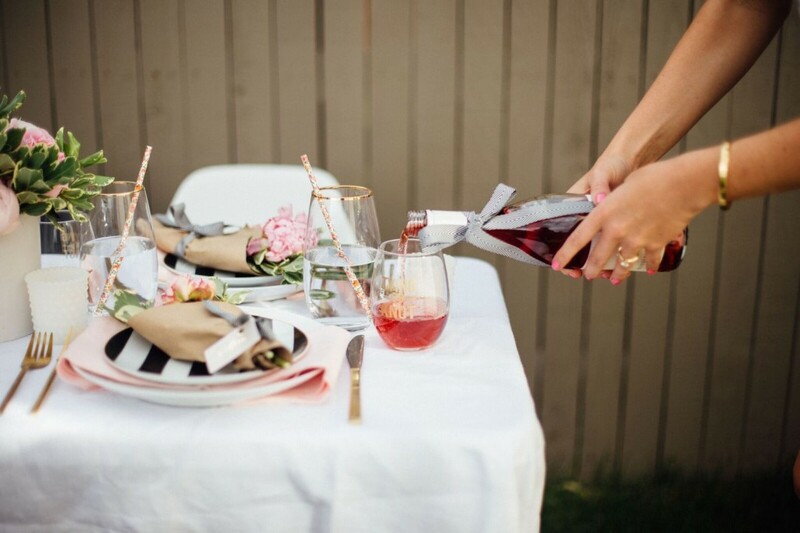 A bridal shower is a time to honor the bride-to-be in anticipation of her wedding. This is a time for giving gifts specifically for the bride and showering her with love from her friends and family. 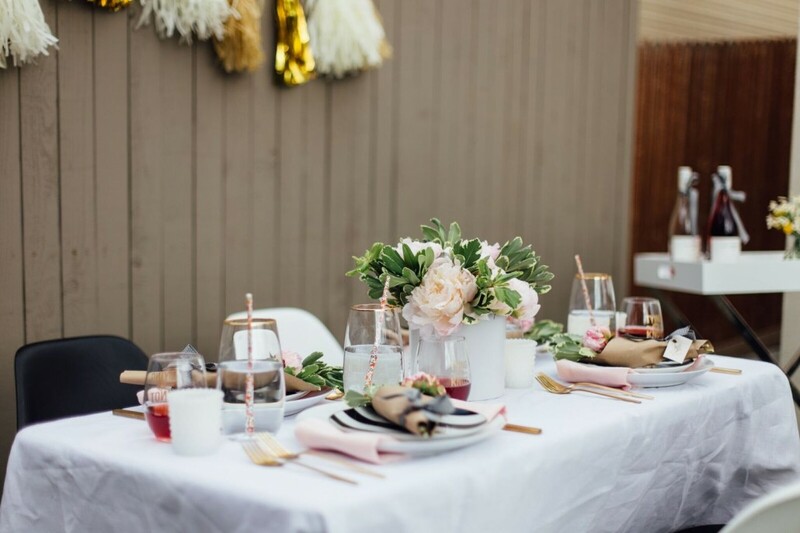 Planning a bridal shower traditionally is left up to the maid of honor, but today really any one can host it. 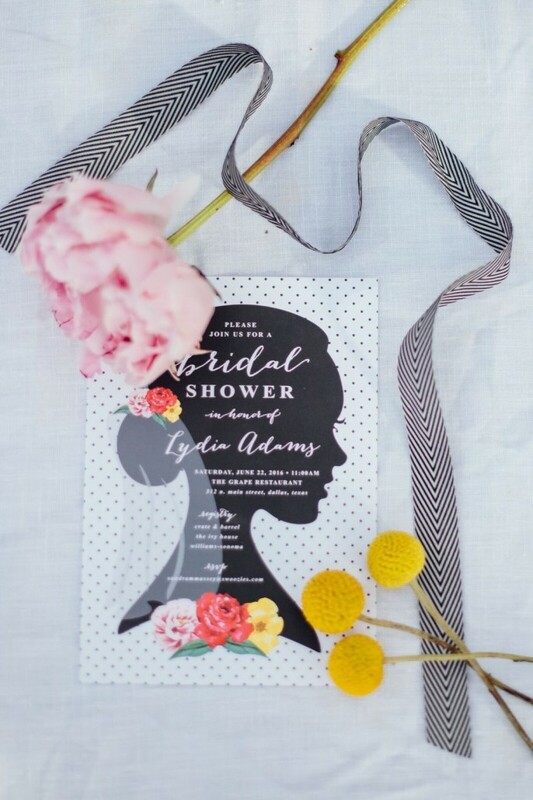 If you are hosting a shower for the bride to be or looking for ideas and inspiration I have you covered. 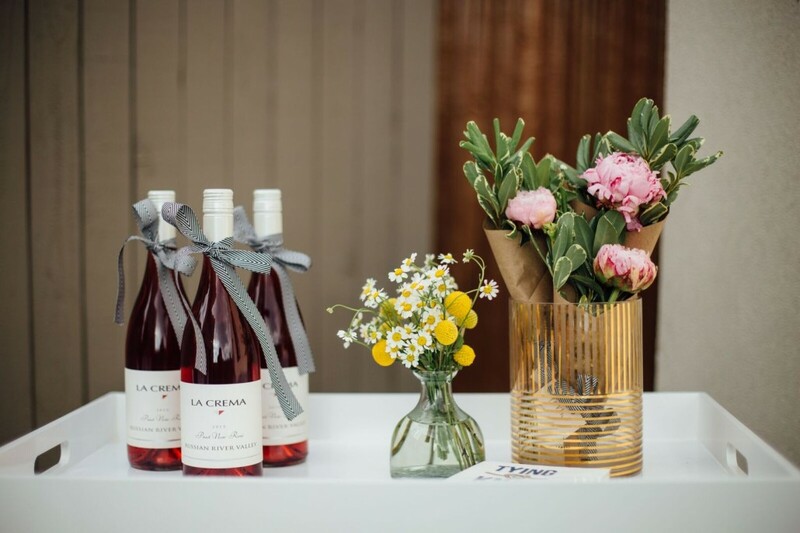 This sweet little backyard shower is the perfect simple DIY party that will make any bride delighted, especially if it is complete with La Crema Wine. Depending on the “theme” of the shower, choose your color pallet and decor carefully. 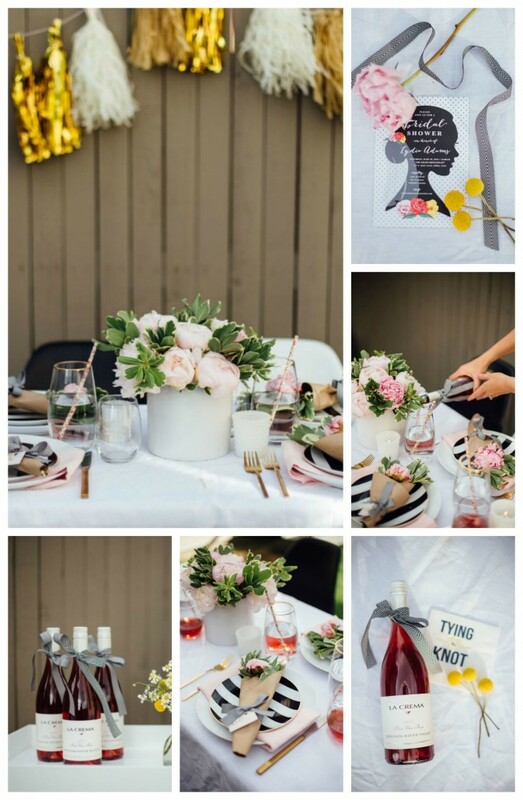 A bridal shower can also get expensive so adding DIY touches to your planning will help bite the cost. 1. 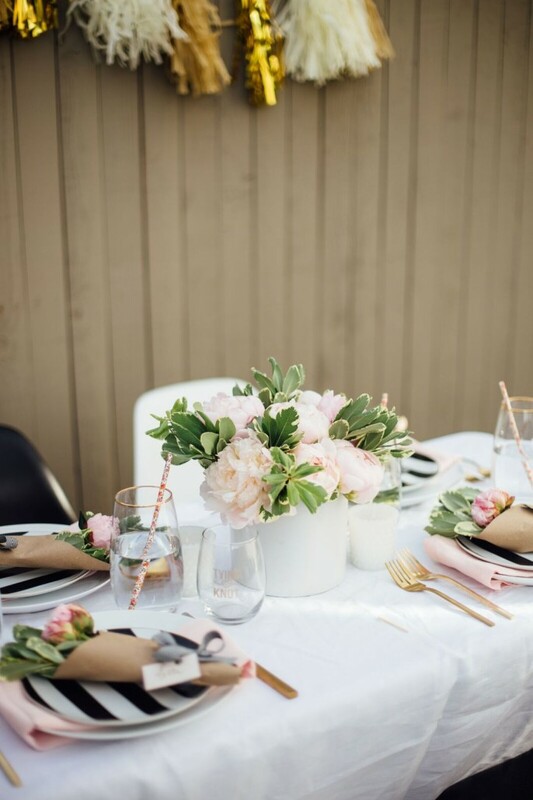 For an easy DIY flower arrangement, if you don’t want to pay for a florist, I recommend choosing one or two flowers fitting in the color scheme of the event. 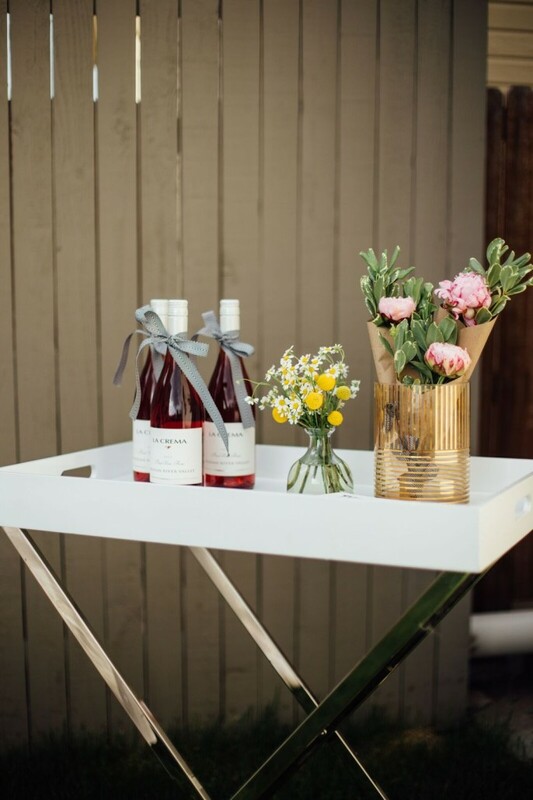 For this party I chose pink as well as yellow and white for the bar cart area to give the event more of a summer feel. 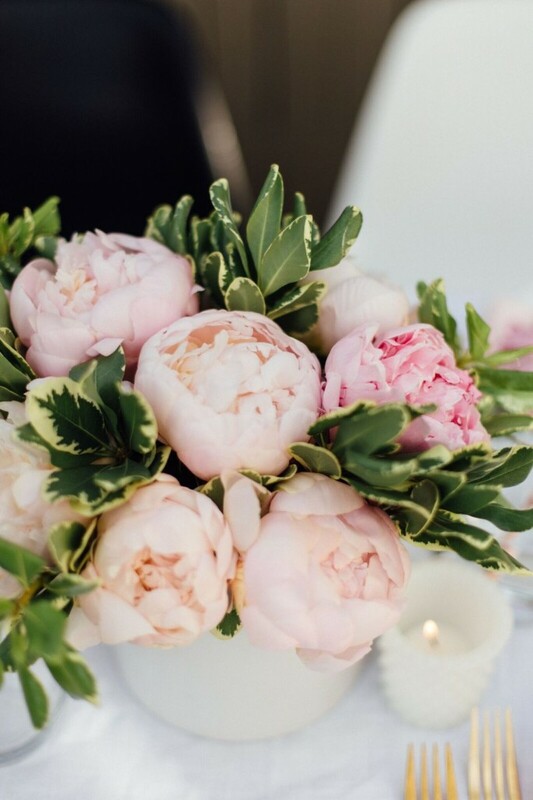 Using peonies and greenery, I arranged a small bouquet for the center of the table. 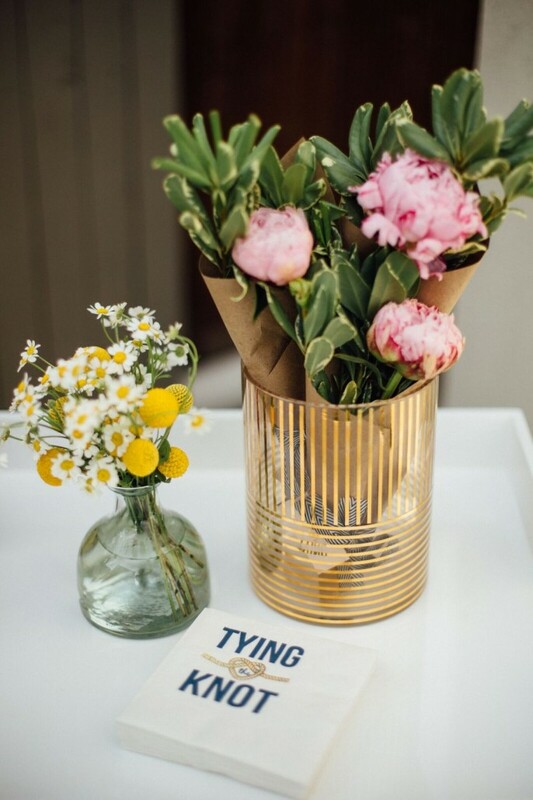 If you need help in arranging flowers check back on the flower arranging post I did! 2. 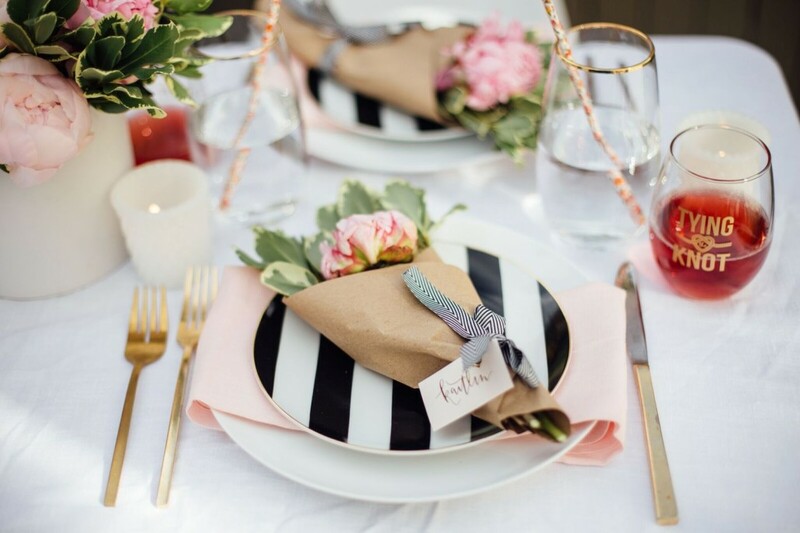 Make sure to have invitations that go with with theme of the brunch so everything ties in. I love these invitations from Swoozies where you can customize anything to your event. Don’t forget to add the registry information to give gift options as well as the attire so your guests know what to wear. 3. 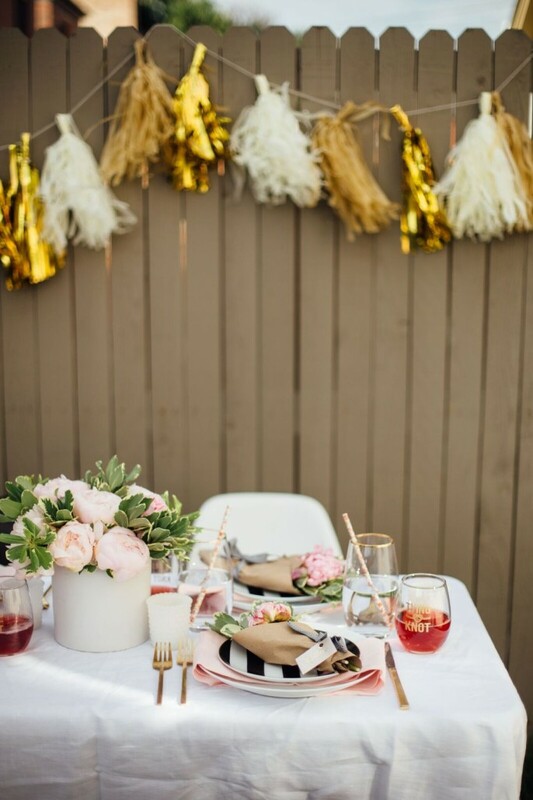 The bride’s taste will depend on the theme and color scheme of the event. 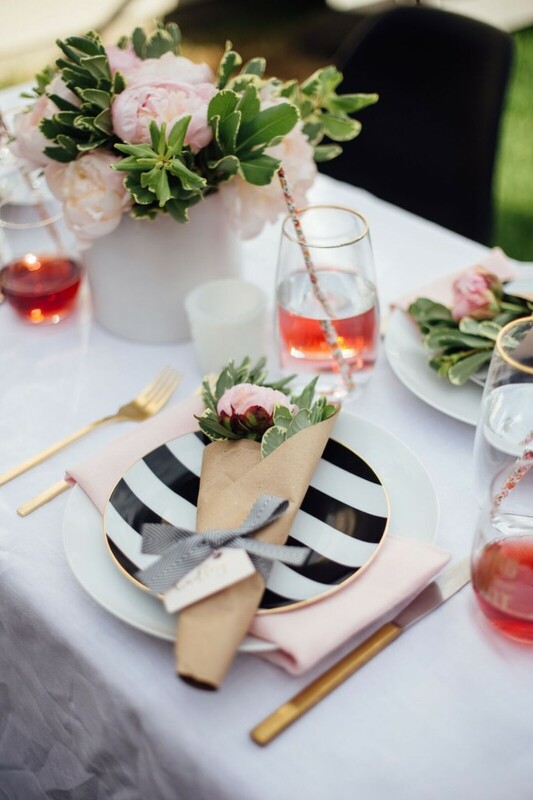 For this I chose to stick to a modern palette of black, white and gold while encompassing a blush pink with the napkins and flowers. 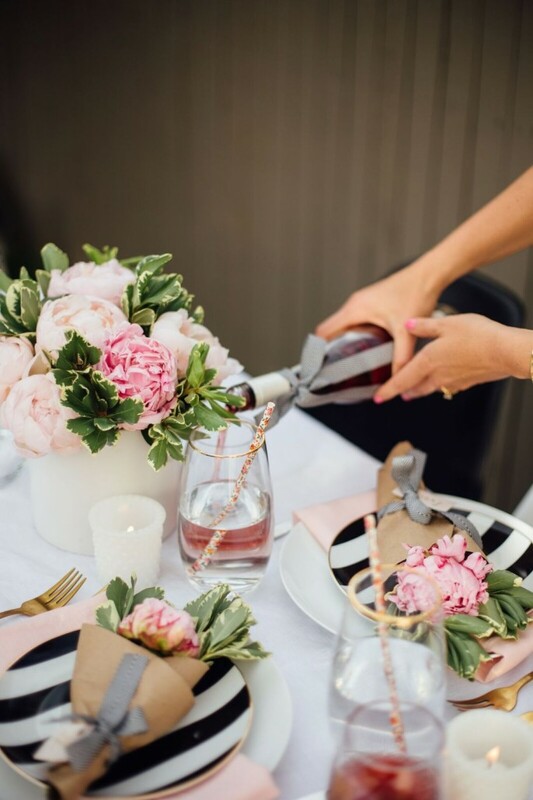 Not every bride is a pink girl so keep in mind her taste when planning. 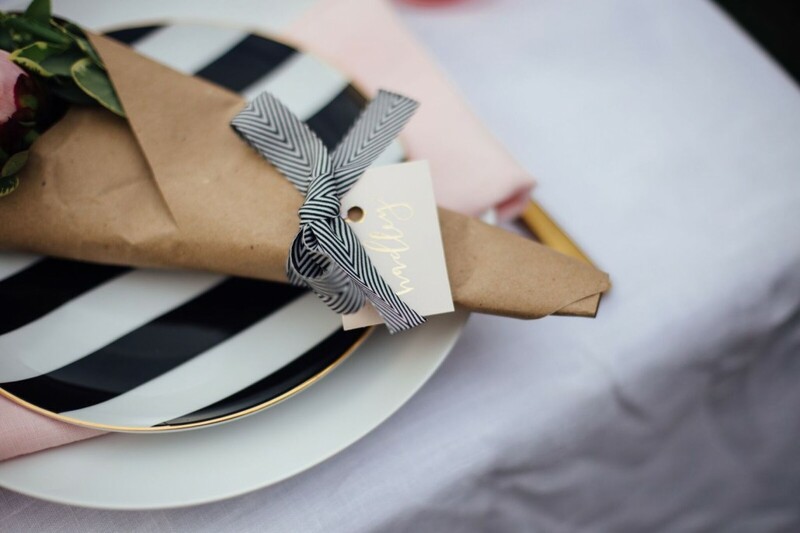 I love these black and white striped plates from Swoozies to tie in the black and white chairs of this modern design. 4. Make all the food yourself (… but of course with the help of family and/or friends if you need it)! 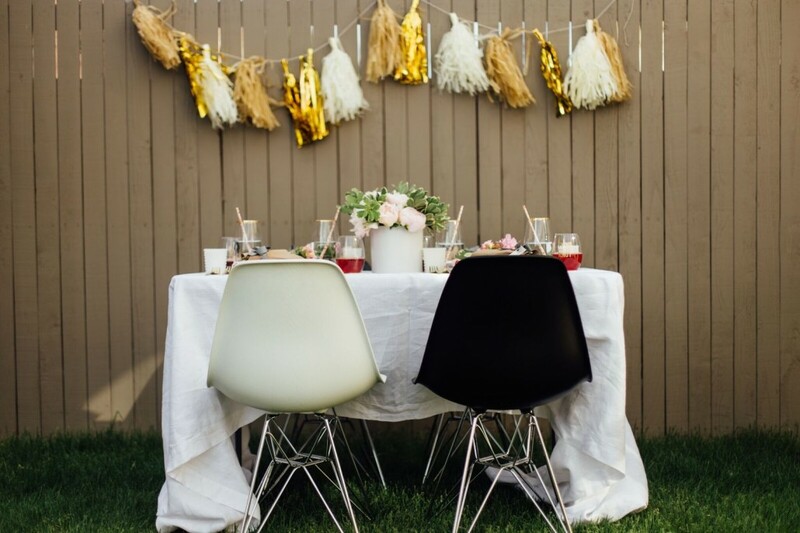 You can also make the shower into a potluck by asking each guest to bring a dish of the bride’s favorite foods. Have light bites for each guest to munch on before sitting down to a lovely brunch. 5. 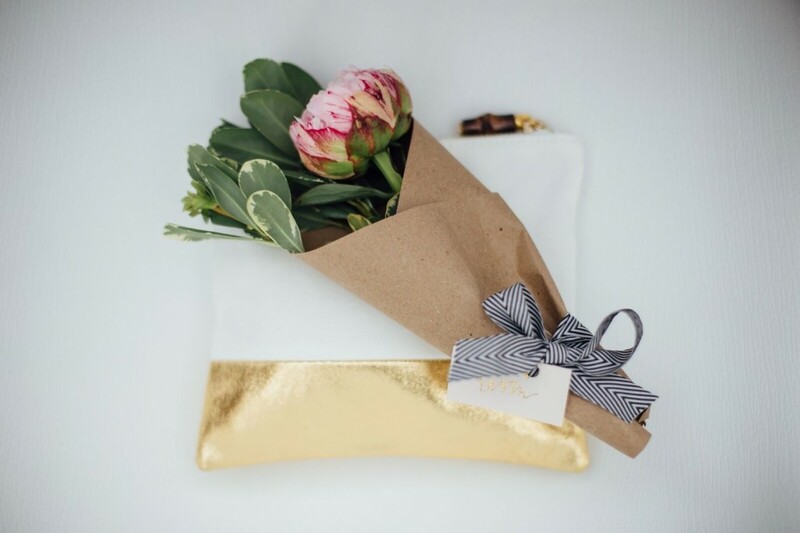 Give each guest a small gift to take home such as a wrapped bouquet of flowers. Using brown paper and ribbon, wrap two or three flowers and tie a name tag through the ribbon. These will also can be used as a place cards as well! 6. 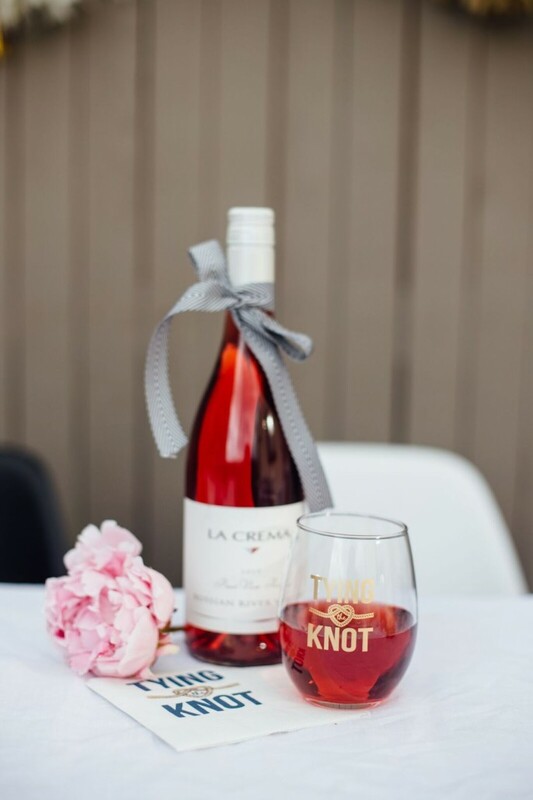 For any bridal shower, especially in spring or summer, I highly recommend the La Crema Pinot Noir Rosé! It is the perfect brunch wine to serve on a warm day. 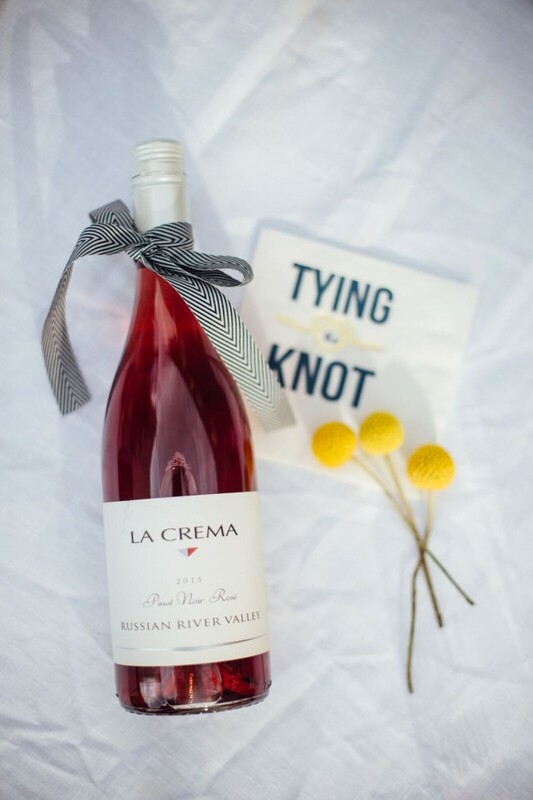 It’s full of refreshing fruit flavors like pink grapefruit, watermelon and lemon and is definitely on the dry side. Make sure to serve it chilled! 7. 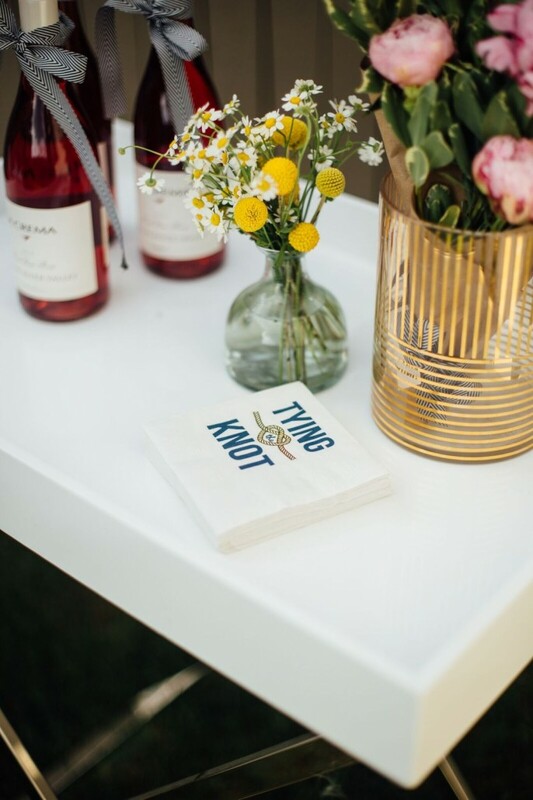 I always love to set up a bar cart area for guests to help themselves. 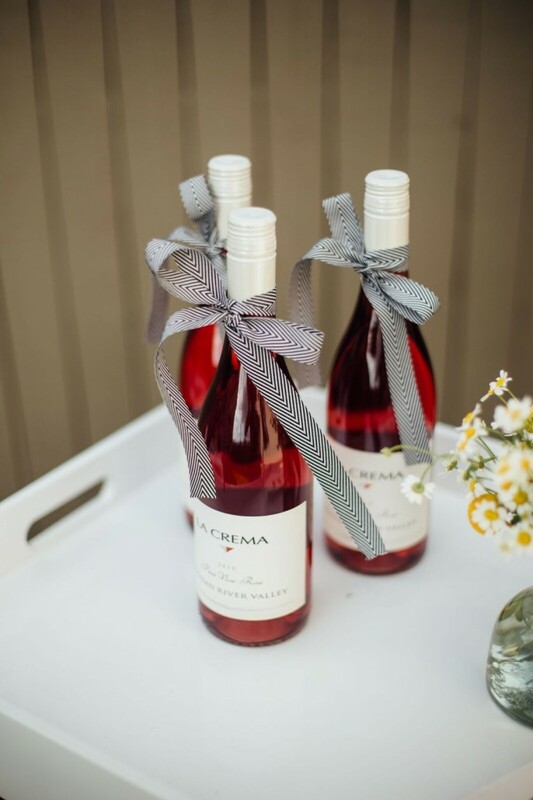 Arrange a few bottles of wine for guests to have easy access to refilling their glass. 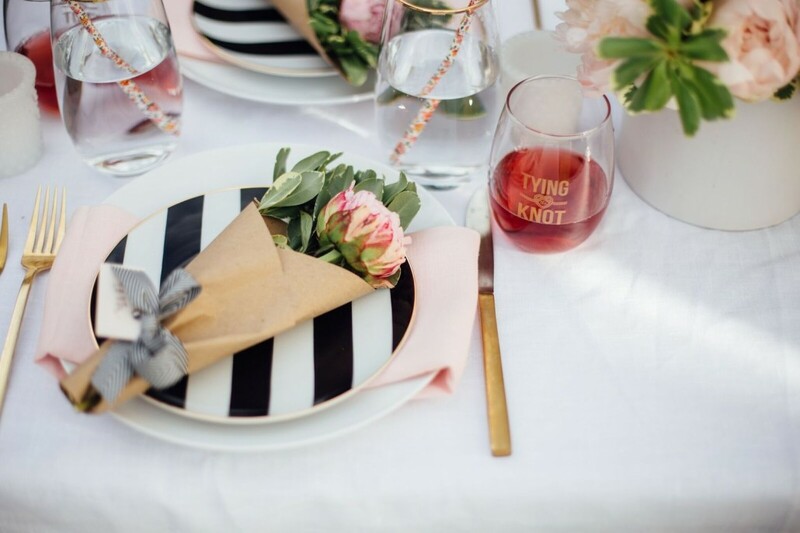 However a good hostess will always make sure her guests’ glasses are full! You can also designate this area for desserts or appetizers. Add a small arrangement of flowers and cocktail napkins for décor and ambiance. Share this event on Pinterest!